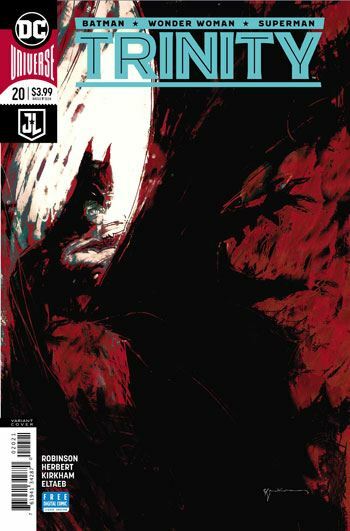 On the one hand, the story in Trinity #20 is very routine. 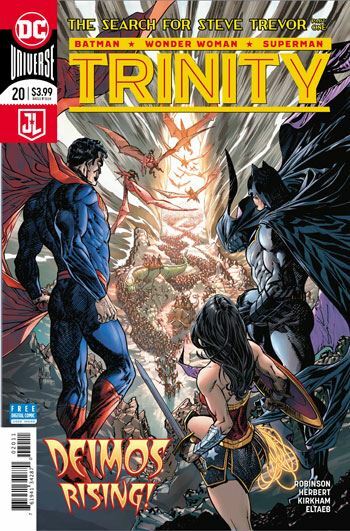 Superman, Batman and Wonder Woman split up to hunt for Steve Trevor, being held captive by Deimos, following the events in the Skartaris storyline. And yet, this story does not feel stale or routine. Absurdly, part of the reason for this is that the characters comment on how mundane it all is. In so many comic book tales the heroes think about how deadly the conflict they are involved in is, or how the danger they are dealing with is so much greater than anything they had faced before. Robinson turns this on its head, and has all three heroes comment repeatedly about how the enemies they are facing in this tale are nothing very special or unusual. That in and of itself is enjoyably offbeat, but Jack Herbert and Tyler Kirkham do such an exceptional job with the art that it all ascends to an even higher level. Batman faces a small army of robot apes, Superman fights kryptonite-laced alien bug robots, and Wonder Woman takes on a giant robot version of Anubis. Aside from all the enemies being robots, they are all particularly suited to the heroes they face. Even the locations are perfectly chosen for the heroes, an urban environment, outer space, and a desert. Had this story tried to tell us what huge peril the three heroes are in, I probably wouldn’t have cared for it nearly as much. Having the heroes feel they are fighting the same old same old as they strive to find Steve makes it all so much more fun.